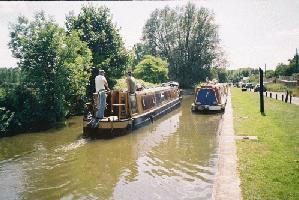 The Canals were the “motorways” of the 18th Century. In the days when roads were un-surfaced – and especially when they quickly deteriorated in the winter to pot-holed muddy tracks – a method was sought by which large heavy cargoes of such commodities as coal, iron ore, grain, china clay, limestone and other building materials and agricultural cargoes such as grain could be transported from the regions of the UK in which they were produced to the docks in London, Liverpool, Bristol and so on. Some clever person came up with “the canal system”, by which boats with cargoes could be moved easily and relatively cheaply on water across country, by one or two people in a canal boat plus a reliable heavy horse to act as the force which propelled the canal boat along. 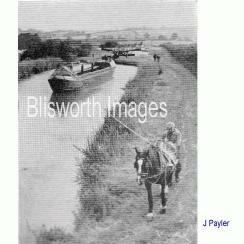 of Blisworth Images and taken by P Digby. Canals were not a new concept. The Romans built them for exactly the purpose for which they were required in the 18th Century (i.e. to move heavy cargoes from A to B) and also for the transportation of large amounts of water across valleys and hills. However, it was only with the dawn of the Industrial Revolution in the 18th Century that entrepreneurs realized the potential of canal construction. They banded together and lobbied Parliament to pass Acts which enabled the construction of canals to commence. The necessary money for investment was quickly raised, and huge gangs of workers were rounded up to start the mammoth task of digging “the Cuts”. 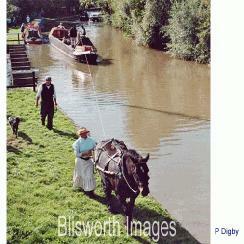 Old photo of horse drawing a narrowboat on a canal - photo reproduced by permission with grateful thanks to Blisworth Images. Photographer unknown. The Cuts were literally that – cuttings into the landscape to enable the water to be channeled along, thus linking rivers and towns. It was easier to dig canal cuttings by following the contours of the land as far as possible. Where major changes in the gradients occurred a different approach was required. In order to make provision for the water to “go up” and “go down” so to speak (and thus to raise and lower boats and their cargoes) locks had to be constructed. The locks were – again – basic technology for the time, but this was the first time that the system of locks had been employed so extensively. The lock system was a wonder of the age. In order to raise boats up steep hills whole staircases of locks were designed, and new systems of filling them with water were devised, such as side pounds. It was an exciting time. 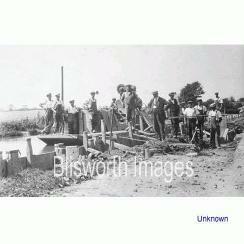 Most of the labourers employed in the canal digs were from Ireland and the industrial north of England. They became known as “Navigators” or “Navvies” for short, and the term is still in use to this day for labourers on building sites. In a space of a little over 30 years most of England from the Thames up to the Yorkshire coalfields was criss-crossed with inter-connecting canals. Some of the canals were cut through hillsides in deep tunnels. This set a problem for the boat people who could not lead a horse through the tunnels because there was no towpath inside. 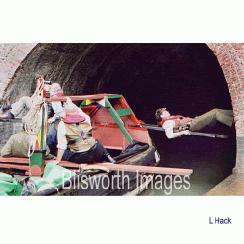 The boats had to be propelled through the tunnels by means of men lying on boards across the top of the narrowboats and literally walking (or "legging") the boats through the length of the cold dark tunnels. Some of the tunnels were over a kilometre in length and this must have been a simply awesome feat. The narrow boats were hauled along by giant Shire horses who plodded along the towpaths at the side of the canals, towing their laden narrow boats behind them. Cargoes were being transported from the Black Country to Liverpool docks via such canals as the Duke of Bridgewater’s canal. He financed this one by himself – and reaped the huge profits which arose from its construction. As far as the Canals and the River Thames were concerned, the thrust was to get cargoes from the Midlands and the North of England down to the docks in the East End of London. This was very successful, and even up until the Second World War the canals were thriving. By the 1950ies however the whole system of moving cargoes by water was in decline, and a new approach was necessary - or the canals would be filled in once again. Thanks largely to the great work of the Inland Waterways Association, and societies like them who campaigned tirelessly on behalf of the canals and conducted a relentless battle to save the inland waterways from destruction, a renewed interest in them grew up 40 years ago. L.T.C. 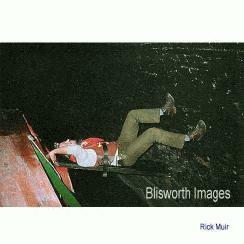 Rolt wrote his now famous classic book “Narrow Boat”, which did much to inspire new generations of people who wanted to experience life on the canals for themselves. Another famous campaigner, Robert Aickman, cruised the waterways and wrote articles that created the publicity that forced local authorities to repair canal routes that had illegally been allowed to become scarcely passable. Gradually people began to see the leisure possibilities in the network of canals that remained. 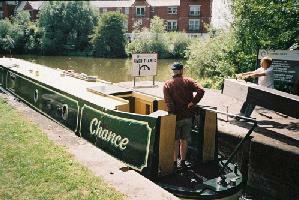 The traditional narrow boat was adapted for leisure use, and boat builders created boats which were the height of luxury, complete with diesel powered engines, showers, fridges and freezers and TVs. All About Boats in the Boatbuilders section. Restoration and campaigning work continues to be undertaken on behalf of the Canals – our great national asset, like the River Thames – by such notables as David Suchet and Lionel Monk and by the tireless efforts of the enthusiasts of the Inland Waterways Association and the Waterways Recovery Group.